Honey is considered one of nature’s oldest and most powerful remedies due to its antiseptic, antibacterial and antioxidant properties. It has a long history dating back to several ancient civilizations. The Egyptians used honey topically as a dressing for wounds and as an embalming fluid. The Greeks, including Aristotle and Hippocrates referred to the healing properties of honey in their writings. Traditional Chinese, Hindu and Ayurvedic medicine have used honey for thousands of years to treat a variety of ailments. 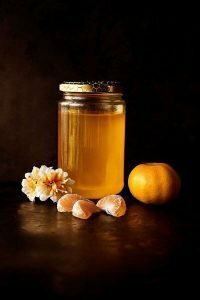 Honey has been used as an ancient remedy for thousands of years, but only recently has it been rediscovered by the medical establishment, especially in treatments where conventional therapy has failed. Literature has promoted honey to cure the common flu, cough, sore throats, diarrhea, and seasonal allergies. In a 2007 publication of the Manchester Evening News in England, it stated that a hospital in New Zealand was using Manuka honey to control methicillin-resistant Staphylococcus aureus (MRSA) and other bacterial infections. Topically, honey has been used to treat diabetic ulcers and peptic ulcers. A Cochrane Library review suggested that honey can reduce the time it takes for a burn to heal; up to four days sooner in certain cases. Honey may reduce the odor, swelling and scarring from wounds. Antioxidants from honey have been used to reduce the damage from colitis in the colon. It can be mixed with olive oil for skin moisturizers and to reduce facial redness, swelling and acne. Honey is gaining acceptance as an agent for the treatment of not only wounds and ulcers but bed sores, gastritis, skin infections, skin inflammations. Honey comes in many varieties and the medicinal properties vary. It is composed of sugars, minerals and depending on the quality of the nectar and pollen from where it is gathered, contains certain vitamins such as vitamin B1, B2, B3, B6, B5 and C. When buying honey, you will see choices from light honey to dark honey. Honey is also offered from those with the comb and those without the comb. Generally, the best choice for its antibacterial properties is to choose honey that is dark and still has the comb in it. Honey is considered safe for adults, but the U.S. Department of Health and Human Services does not recommend feeding raw honey to children under 1 year old due to the risk of botulism. Botulism is bacteria that is found in dust and soil and can absorb into honey. Infants do not have a developed immune system to defend themselves against a botulism infection. Parents can feed their children cereals or other foods that are sweetened with honey as long as the honey has been cooked. As we welcome this season’s tidings, why not try to sweeten it with honey?